Fall is a great time to establish a new lawn or overseed an existing one! Cooler nights make it easier to keep the seeds moist during germination. Most of the weeds that compete with grass are dead and diseases are under control. The new grass will have the fall and spring seasons to mature before facing all the stress of summer! Pearl’s Premium grows well in all regions. Is Moss A Problem On Your Lawn? The best way to tackle moss is to consider what conditions in and around your soil make it the perfect environment for moss to thrive in. Generally speaking, moss exists where the conditions are anything but good for turf. Compact soil, low fertility, soil acidity, excess moisture with bad drainage, inadequate soil depth and deep shade are all possible reasons why you may be growing moss instead of turf. The trick to keeping moss away is by promoting a healthy lawn. Photo: Installing a rain garden (in the foreground) did not solve this water runoff issue. Once Pearl’s Premium was planted, long roots (12-48") not only absorbed the runoff water, but took care of the grub problem as well! 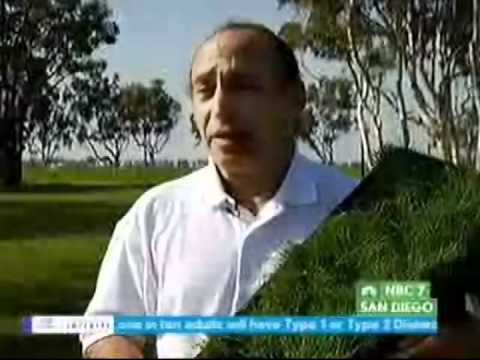 We at Pearl's Premium want you to have a great lawn. Because soil temperatures may be too high this time of the year in some parts of the country, please check your soil temperature on our website. On the home page in the upper left hand corner, click on the green button, "Is it grass planting time in my area"? Your local soil temperatures need to be between 50 and 70 degrees Fahrenheit. If in that range, you are ready to plant. Cut your lawn extremely short and surface rake away clippings. Do not de-thatch in spring. 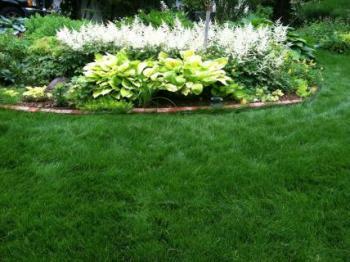 Pearl's Premium generally outcompetes the old lawn and weeds. Pearl's Premium Saves You Time, Money & Water! Pearl's Premium will save you hundred of dollars in lawn care! From watering, fertilizer, to moving each season! 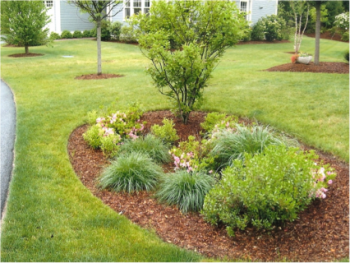 It is drought tolerant grass and grows slowly, and only needs to be cut once a month! What more could you ask for! Finally, a safe lawn seed! Pearl’s Premium Lawn Seed is all organic and safe for your entire family. Not only is it safe, but it is saving our water supply as well. It is estimated that lawn care uses 50% of our county’s potable water. With other lawn seeds, it might be necessary to have to water your lawn all the time, which is a waste. However, with Pearl’s Premium watering frequently is not necessary, and can help conserve the water. Tips for a Brand New Lawn! When deciding to plant all new lawn, Pearl’s Premium is the right way to go. It is low maintenance, and withstands all weathers. For beginners, we have a simplified instruction for your brand new lawn using Pearls Premium! So we can help every step of the way! Tip: Cut grass high (3" minimum) to shade out weeds and promote healthy root growth.